On April 27th 2017 the Russian Navy Moma-Class AGI Liman|Лиман had a really bad day. On April 27th the Togo-flagged livestock vessel "Youzarsif H" (also referred to as "Youzar Sif.H"), IMO 7611547, and the Russian Navy Moma-Class AGI Liman|Лиман collided, between 08:30Z and 08:43Z, in thick fog, outside Turkish territorial waters, in the Black Sea. A breach below the water line caused the Liman to sink, reportedly after several hours. 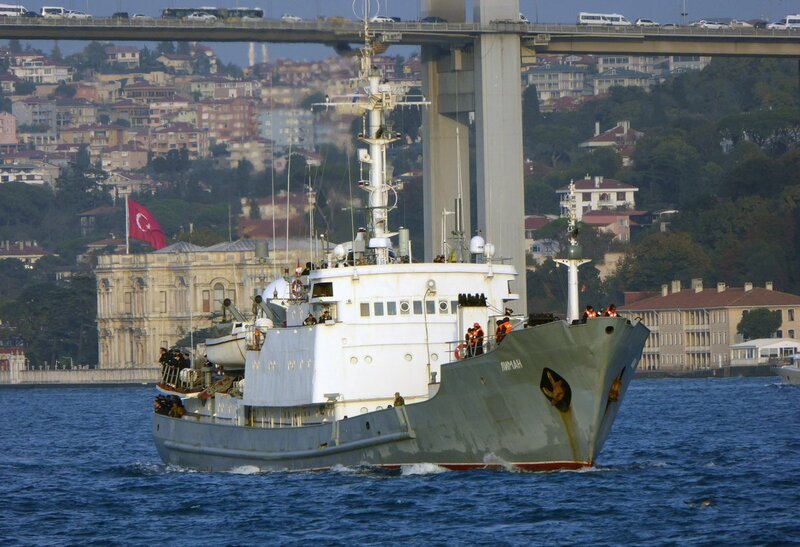 All crew were rescued in an orderly fashion from the pictures that were released by the Turkish coast guard. It was reported that the Youzarsif H headed back to port to check for damage and out of concern for the livestock; sheep. Pretty much everything beyond that is speculation. You should really read this excellent in-depth analysis by Tony Roper, a frequent contributor to IHS Jane's publications, before reading further, to get up to speed. Any ship could have an accident while at sea, in the fog, early in the morning. But, this wasn't "any" ship; just by being a Russian Navy AGI (a "Spy Ship") it makes me +1 suspicious. There is no good rational basis for that suspicion, except it's a Russian Navy AGI, it definitely has sensitive gear aboard, and having it sink leaves a gap in whatever task it was doing, on the deployment it was on. 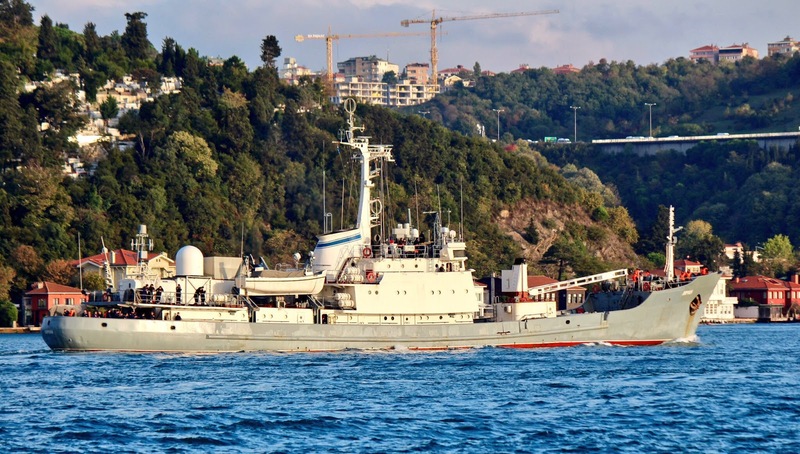 This is a seemingly inadvertent win for NATO, and a loss for the Russian Black Sea Fleet. There have been no reports regarding who ran into who; or if it was a mutual effort. The news media is making it sound like they were both moving and collided in the fog. I'm not sure that's correct. Was this a "T-Bone" collision while both were moving? Was this a T-Bone collision, while the Liman was stationary? Was this a glancing bow-on-bow strike? We know the Youzarsif H was moving at 11kn before the collision, and suffered superficial damage to its bow, but we don't know if the Liman was stationary or not, since it conducts its operations without using an AIS transponder. While the Liman does not transmit its location with an AIS transponder, can it receive AIS? Could it not "see" the other ship coming? Could these frequencies have been "jammed" intentionally, or accidentally? Likely not; any disruption to those frequencies should have affected all VHF maritime communications in the area. No such issues were reported, and most ships were beaconing fine on AIS. The Liman was not a "stealth" ship, and as far as I understand, should have shown up on the navigational radar of the Youzarsif H; isn't that why navigational radar exists? How didn't the captain or navigator of the Youzarsif H see it? ...or did they, and dismissed it as noise because it didn't transmit AIS? Shouldn't there be a collision alarm built into the system? They were in thick fog, only navigating by instruments, and didn't see a ship directly in front of them on radar? I don't think it reflects well on the Youzarsif H's crew, unless the operations of the Liman were causing issues for the radar of the Youzarsif H. Yes, that's wild speculation, because it makes no sense how a ship doesn't notice a giant hulk of floating steel in front of it on radar. Make up your own crazy theory! It's better than what we have now, which is nothing. The Youzarsif H's AIS signal was being received by terrestrial based AIS receivers, which Mr Roper described in his blog post with excruciating detail. The signal was very spotty before the collision, and crystal clear after the collision. This is the thing that really draws my eye and triggers my curiosity; it is the basis for much of my suspicion regarding this event. On the day Mr. Roper and I were discussing this he specifically dismissed my speculation that the issue could be related to the sender and insisted the gap in reception must be related to the receiver, or environmental conditions. "This totally depends on the receiver not the sender! The receiver may have been off." I tried to convey that my interest was less with the gap before the collision, and more with the immediate change to the signal quality (seemingly crystal clear reception) instantaneously after the collision, which Mr Roper had no explanation for at the time. It seems after reflection, he now theorizes the sender, may have had their antenna(s) facing away (blocked by the ship's superstructure?) from the shore-based receiver when travelling Southbound (toward the Liman) and immediately after the collision turned around and faced their AIS antenna(s) toward the shore-based AIS-T receiver. This is fantastic speculation, and would explain how the signal went from terrible, to perfect, immediately, while other ships in the area had AIS-T signal all along. When did the collision occur? At 08:30Z, as you can see, the Youzarsif H was moving at 11kn on a course of 194 degrees. At 08:41Z, 11 minutes later, it was doing 9.5kn, still on the exact same course of 194 degrees. Could they have hit the ship, and shoved it aside, keeping the exact same course? I don't think so. They had significantly reduced speed by then; did they see the Liman coming and reduce speed, or were they in the middle of colliding with it at that moment? At 08:44Z, only 3 minutes later, they had dropped to 0.7kn and changed course to 199 degrees; the collision had already happened. I suspect the collision happened between 08:41 and 08:44, based on the course and speed. You'll notice the AIS-T problems cleared up at that exact moment too; they were at 3-4min intervals from then on. There is supposed to be an investigation underway by the Turkish authorities regarding this incident, and I look forward to hear what their conclusions are. 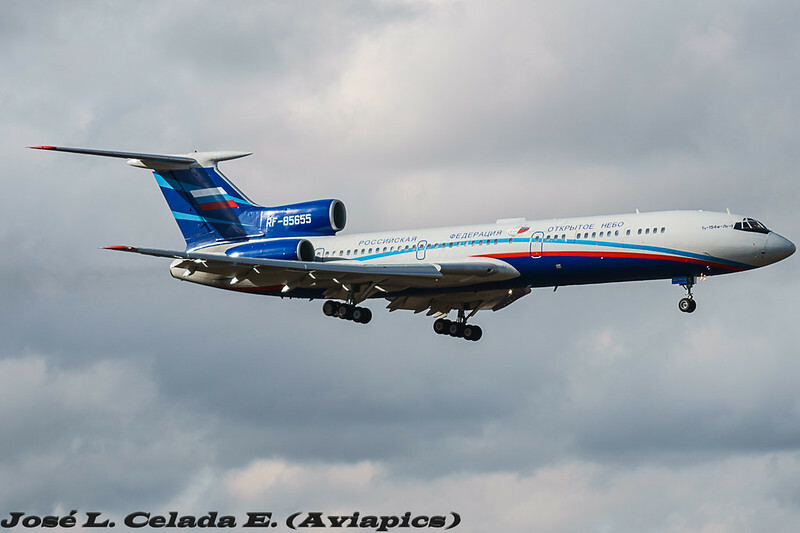 I've written a lot about the Open Skies Treaty (here), and this week the Russian Federation Open Skies Treaty certified Tu-154M is once again in the skies over the United States. There has been less media coverage this time, perhaps because the media didn't realize these flights normally happen once every month or two, and over cycled just weeks ago. In short, 34 nations are signatory to the treaty, that lets the signatories overfly each others territory, with short notice, and members of the overflown nation's military on board, to take 30cm resolution pictures of sites of interest. 30cm is the defined maximum image resolution, and was the same when the Russian's used wet film. The rest of the countries still use wet film, so far. This time, the Russians flew into Travis AFB on the West Coast, after stops for fuel in Iceland and Canada, and started observation flights Thursday March 18th 2017. The flight plan would have been tabled either late Monday or early Tuesday, and a memo to all US Military (and related to military) sites that were going to be overflown would have been sent to ensure all unicorns were in their stables, and all stolen alien technology was back underground at Area 51, or, you know, whatever. Here is a quick and dirty map of the locations they overflew. Why? Well, think of it this way. The sites that the RuAF are taking pictures of have been requested by the Russian Intelligence Community. Something at these sites is interesting to someone, likely in the Russian defence industry. But don't they have Google Maps? Yes, but Google Maps / Bing / Nokia are all routinely tampered with by "Agencies", and the services are happy to do so to keep on governments' good sides. Entire airports can be removed and farms photo-shopped in. Buildings are over-exposed to blot out what's on top. Facilities are entirely pixelated. Imagery is overtly tampered with, shadows moved, objects cloned. What you see on Google Maps is what the government is allowing you to see; Russia knows that. While 30cm resolution isn't the greatest commercially available, it is good enough to show tanks loaded on rail cars, new buildings that have cropped up out of nowhere, etc.. They know their camera, and the pictures it takes, have not been tampered with. Using its new-last-year Digital Electro Optical sensor, the flight has been basing itself out of Travis AFB in California, and at the end of the first day of observation flights, I believe it has taken pictures of the following locations, based on the altitude and airspeed. Looking at the map below, and where you see a red dot, the plane was between 290-310kn, the sweet spot to take pictures. The hills east of Hollister / San Benito County, California. With two observation flights complete, the Russians flew the first leg of their trip back to Moscow on May 20th, stopping for an overnight stay in Canada at CFB Trenton, which is a treaty approved refuelling stop. All countries which are signatory to the Treaty on Open Skies must provide logistical support to Open Skies Treaty transit flights. April 13-14th 2017 the Russian Federation conducted an overflight of the United States in compliance with the Open Skies Treaty, with members of the USAF on board. You will notice the sites along the Eastern Seaboard are all at locations where the Russian Navy AGI Viktor Leonov AGI spotted in February and March. Coincidence? Absolutely not. The Viktor Leonov's mission is to profile subs, investigate coastal radar, sonar, subsurface sensors, etc. The Open Skies Observation flight was more than likely to check out the same sites it was performing ELINT on, to "see" from above the interesting things it picked up while it was at least 12 nautical miles from shore.